Big Island whale watching can be an ocean-shattering experience, literally. The best time for Humpback whale watching in Hawaii is between November and April, with the peak taking place between January and March. Humpback whales travel here to mate, returning the following year to give birth, so you will likely see adults and calves alike playing not far off the coast. Every fall thousands of Humpback whales travel 3500 miles from their summer feeding grounds off Alaska to their winter mating grounds off the Hawaiian Islands. It's a truly remarkable feat! Consider that Humpbacks swim from north Alaska to a tiny spot in the middle of the largest ocean on earth every fall, then make the return trip in the spring. The migration takes approximately 4-8 weeks. How do they navigate so precisely and find Hawaii every year? 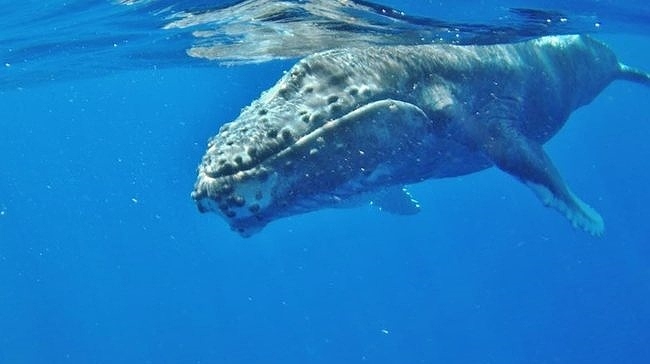 Studies have shown that a metalloid substance near the frontal lobe of the Humpback whale’s brain (magnetite) may allow whales to detect changes in the earth’s magnetic field, helping them navigate during migration and precisely locate their breeding grounds. For 6 months or more each year, these behemoths grace the waters off the Hawaiian Islands. An individual Humpback Whale can be identified by unique black & white markings on the underside of it's tail fluke, so it's easy to tell which whales have returned to Hawaii each winter. 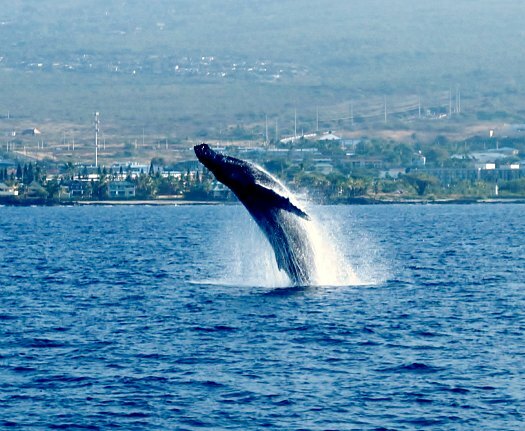 Amazingly, Humpback Whales do not feed during their time in Hawaii. Part of the reason the water off Hawaii is so clear and blue is that it lacks many of the tiny, microscopic plants (phytoplankton) that bait fish feed on. Consequently our waters also lack many of the food sources essential for the diet of Humpback whales. Rather than feeding in Hawaii, they rely on stored energy from their summer feeding in Alaska. On average a Humpback whale will lose 6-8 tons of its body weight over the course of the winter! As a result, each spring they must make the return migration to the colder Alaskan waters in order to rebuild their blubber. It is not unusual for a Humpback whale to live more than 60 years. An adult Humpback will weigh approximately 40 tons (36 tonnes) and can exceed 50 feet (15 meters) in length. It is an awesome sight to watch one of these mammoth creatures thrust all 40 tons of its weight and propel itself into the air in a full breach. Whale watching in Hawaii is sometimes as simple as peering out at the ocean from the beach you happen to be enjoying. Bring a pair of binoculars, find a quiet place to sit, and be patient as you gaze out on the ocean. Humpback whales tend to prefer the shallower waters near the coast. The first sign is often the spray that indicates a whale has surfaced to breathe, called the blow. As a whale forcefully expels air through its blowhole, the spray might look like a small splash on the surface of the ocean. The blow is obviously much easier to detect when the wind is calm and the ocean is void of whitecaps. Some of the best Hawaii whale watching can be found where lava flows protrude out into the ocean along the west coast. There are special viewing opportunities at Pu'ukohola Heiau from December through March, Fridays between 9 and 11am. Located near Kawaihae and Spencer Beach north of Waikoloa, the elevated view from Pu'ukohola makes this one of the best places to spot whales. 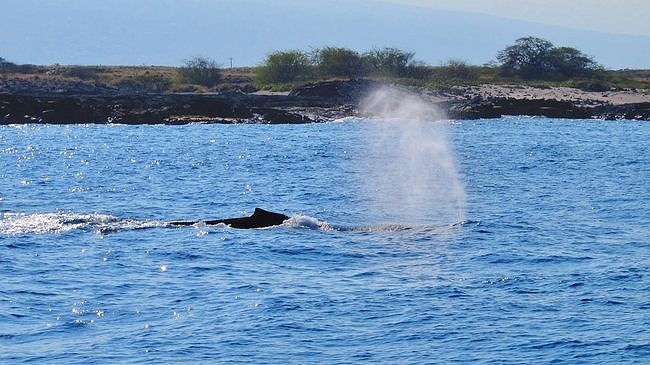 Many areas along the coast north of Kawaihae can also be promising for sighting whales, including at Lapakahi State Park. Between December and April, we frequently see whales breaching off the coast of the Big Island. The real thrill in whale watching is when you can get a closer view, and for that you'll need a boat. This is especially true after the Humpback whales have moved on in the spring. A boat is the only way you might see other species of whales that reside here year-round (pygmy killer whales, false killer whales, pilot whales, giant sperm whales, beaked whales and melon-headed whales). There are several companies that offer Big Island whale watching tours. Hawaii whale watching tours are generally only available during Humpback season between November and April. Zodiac Raft Whale Watching Adventure is one of our favorites. The benefit of the Zodiac is that you are closer to the water, and therefore, closer to the whales. This is a 3-hour tour departing 8am daily from Honokohau Marina. This catamaran sails early morning (8am) from Anaeho'omalu Bay near the Waikoloa Beach Marriott Resort. 2-hour sail tour with guaranteed whale sightings. This afternoon cruise aboard a double-deck catamaran departs 1pm from Kailua Pier in Kailua Kona. 2.5-hour cruise with guaranteed whale sightings. The Humpback whale is on the endangered species list. In 1992 The Hawaiian Islands Humpback Whale National Marine Sanctuary was created by Congress to protect Humpback whales and their habitat in Hawaii. Learn more about the sanctuary including NOAA's favorite Humpback whale viewing spots, whale watching tips, whale behavior and current research.